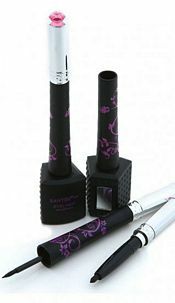 Liquid and pencil eyeliner set. Including handy mirror. Eyes in the color black of the brand Santee can be found in the category make-up at Cosmoda. Shop these and many more trendy make-up today and receive your order the next day at home! Pay afterwards, free shipping and free return! Buy this item and earn 9 points valued at � 0.90. Check conditions.